To learn more about the nature of a service, please read this article. Please see the example applications developed by Chris Richardson. 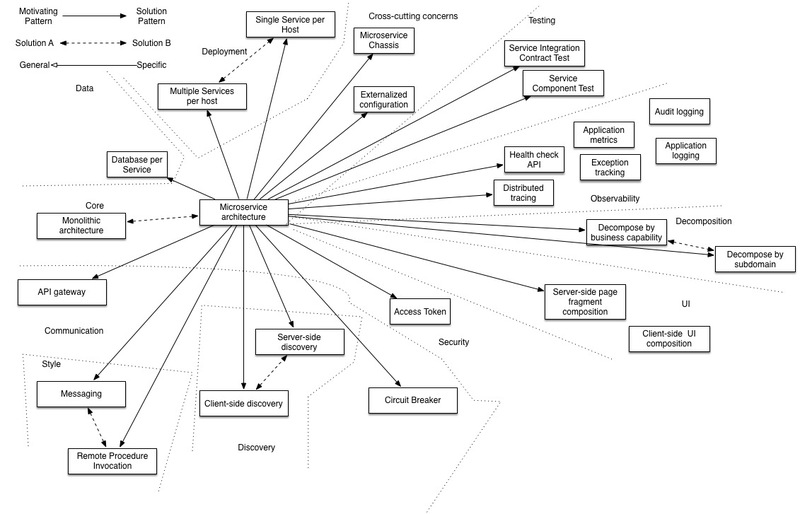 These examples on Github illustrate various aspects of the microservice architecture. Enables the continuous delivery and deployment of large, complex applications. It enables you to organize the development effort around multiple, autonomous teams. Each (so called two pizza) team owns and is responsible for one or more services. Each team can develop, test, deploy and scale their services independently of all of the other teams. Eliminates any long-term commitment to a technology stack. When developing a new service you can pick a new technology stack. Similarly, when making major changes to an existing service you can rewrite it using a new technology stack. Developer tools/IDEs are oriented on building monolithic applications and don’t provide explicit support for developing distributed applications. Deployment complexity. In production, there is also the operational complexity of deploying and managing a system comprised of many different services. Increased memory consumption. The microservice architecture replaces N monolithic application instances with NxM services instances. If each service runs in its own JVM (or equivalent), which is usually necessary to isolate the instances, then there is the overhead of M times as many JVM runtimes. Moreover, if each service runs on its own VM (e.g. EC2 instance), as is the case at Netflix, the overhead is even higher. There are many issues that you must address. When to use the microservice architecture? One challenge with using this approach is deciding when it makes sense to use it. When developing the first version of an application, you often do not have the problems that this approach solves. Moreover, using an elaborate, distributed architecture will slow down development. This can be a major problem for startups whose biggest challenge is often how to rapidly evolve the business model and accompanying application. Using Y-axis splits might make it much more difficult to iterate rapidly. Later on, however, when the challenge is how to scale and you need to use functional decomposition, the tangled dependencies might make it difficult to decompose your monolithic application into a set of services. How to decompose the application into services? Decompose by business capability and define services corresponding to business capabilities. Decompose by domain-driven design subdomain. Decompose by verb or use case and define services that are responsible for particular actions. e.g. a Shipping Service that’s responsible for shipping complete orders. Decompose by by nouns or resources by defining a service that is responsible for all operations on entities/resources of a given type. e.g. an Account Service that is responsible for managing user accounts. Ideally, each service should have only a small set of responsibilities. (Uncle) Bob Martin talks about designing classes using the Single Responsibility Principle (SRP). The SRP defines a responsibility of a class as a reason to change, and states that a class should only have one reason to change. It make sense to apply the SRP to service design as well. Another analogy that helps with service design is the design of Unix utilities. Unix provides a large number of utilities such as grep, cat and find. Each utility does exactly one thing, often exceptionally well, and can be combined with other utilities using a shell script to perform complex tasks. How to maintain data consistency? In order to ensure loose coupling, each service has its own database. Maintaining data consistency between services is a challenge because 2 phase-commit/distributed transactions is not an option for many applications. An application must instead use the Saga pattern. A service publishes an event when its data changes. Other services consume that event and update their data. There are several ways of reliably updating data and publishing events including Event Sourcing and Transaction Log Tailing. Another challenge is implementing queries that need to retrieve data owned by multiple services. The API Composition and Command Query Responsibility Segregation (CQRS) patterns. There are many patterns related to the microservices pattern. The Monolithic architecture is an alternative to the microservice architecture. The other patterns address issues that you will encounter when applying the microservice architecture. The Database per Service pattern describes how each service has its own database in order to ensure loose coupling. The API Gateway pattern defines how clients access the services in a microservice architecture. The Client-side Discovery and Server-side Discovery patterns are used to route requests for a client to an available service instance in a microservice architecture. The Messaging and Remote Procedure Invocation patterns are two different ways that services can communicate. The Single Service per Host and Multiple Services per Host patterns are two different deployment strategies. Most large scale web sites including Netflix, Amazon and eBay have evolved from a monolithic architecture to a microservice architecture. Netflix, which is a very popular video streaming service that’s responsible for up to 30% of Internet traffic, has a large scale, service-oriented architecture. They handle over a billion calls per day to their video streaming API from over 800 different kinds of devices. Each API call fans out to an average of six calls to backend services. Amazon.com originally had a two-tier architecture. In order to scale they migrated to a service-oriented architecture consisting of hundreds of backend services. Several applications call these services including the applications that implement the Amazon.com website and the web service API. The Amazon.com website application calls 100-150 services to get the data that used to build a web page. The auction site ebay.com also evolved from a monolithic architecture to a service-oriented architecture. The application tier consists of multiple independent applications. Each application implements the business logic for a specific function area such as buying or selling. Each application uses X-axis splits and some applications such as search use Z-axis splits. Ebay.com also applies a combination of X-, Y- and Z-style scaling to the database tier. There are numerous other examples of companies using the microservice architecture. Chris Richardson has examples of microservices-based applications. See my Code Freeze 2018 keynote, which provides a good introduction to the microservice architecture.